Parking structures present a unique opportunity for cleaning. Because of the low ceilings and tight quarters, standard street sweepers just won’t fit. 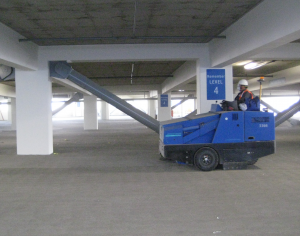 The American Lincoln indoor sweeper solves this problem.A tight turn radius means it can make it into those hard to reach places ensuring that more of your parking structure is swept. They run on propane so there’s minimal exhaust allowing them to run in confined spaces with no danger to the driver or your workers. They’re perfect for keeping a clean job site or as preparation for handing over the parking structure. Thinking of pressure washing the parking structure? Be sure to sweep the structure first to pick up any loose dirt. Sweeping the parking structure with the American Lincoln first will allow the pressure washers to work twice as fast and give you a better result.